The North Carolina Booklet was a numbered and dated series of pamphlets published in Raleigh by the North Carolina Daughters of the American Revolution. Begun under the leadership of the society's founder, Mrs. Spier Whitaker, the Booklet was intended to develop and preserve North Carolina history by chronicling important events in a monthly publication. From 1901 to 1905 the Booklet appeared monthly, but in 1905 it changed to a quarterly. It continued as a quarterly until 1920, appeared for a year as a semiquarterly, and then was published annually, with one interruption, until 1926, when it ceased operations. Raleigh native Mary Hilliard Hinton, educated at St. Mary's School and Peace Institute, was the Booklet's editor throughout most of its life. Hinton's editorial assistants demonstrated great skill in historical and biographical research and writing, and the publication earned the respect of many of their contemporaries, including highly regarded educators of both men's and women's colleges, and from the general public. Civic and military leaders of the late nineteenth and early twentieth centuries wrote for the series, and businesspeople, jurists, and literary figures were among its contributors as well. The Booklet also published contributions by many noted historians of the state, including Samuel A. Ashe, Kemp P. Battle, R. D. W. Connor, J. Bryan Grimes, Marshall DeLancey Haywood, and Stephen B. Weeks. The North Carolina Booklet. Raleigh, N.C.:Capital Printing Company, May 1901-April 1921. http://digital.ncdcr.gov/u?/p249901coll37,14062. Daves, Graham. 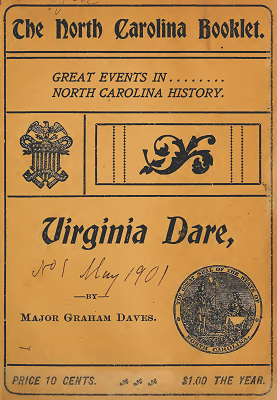 The North Carolina Booklet: Virginia Dare. Raleigh, N.C.:Capital Printing Company, May 1901. http://digital.ncdcr.gov/u?/p249901coll37,14179.